Fluid Power represents Huade, a Chinese government initiative originally established as a joint venture with Mannesmann Rexroth of Germany. The range is comprehensive and includes a full spectrum of valves and pumps. Mannesmann Rexroth AG and Beijing Huade Hydraulics Industrial Group Co., Ltd. entered into a Joint Venture Contract dated July 13th, 1995 and established a Joint Venture Company ‘Rexroth (Beijing) Hydraulic Co., Ltd.’ with their joint investment in Beijing, PRC. In 2002 Mannesmann Rexroth AG merged and was named Bosch Rexroth AG.The Joint Venture was terminated in 2002 when Bosch Rexroth AG acquired and took over any and all of the shares in the Joint Venture Company “Rexroth (Beijing) Hydraulic Co., Ltd. from Beijing Huade Hydraulics Industrial Group Co., Ltd.
Beijing Hydraulics no longer have any connection with Bosch Rexroth AG. Fluid Power Group (Pty.) Ltd. is in no way affiliated with the Bosch Rexroth Corporation. The name Bosch Rexroth is used for reference purposes only. Fluid Power Group supplies hydraulic equipment from Huade. 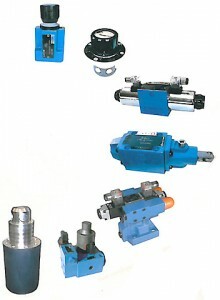 The main products of Huade Hydraulics are Hydraulic Valves, Bent Axis Pumps and Motors, Power Units and Castings. Common uses for these pumps, motors and power units would be Machine Tool, Hot Metals Industry, Injection Moulding Machines, Hot Strip Mills, Hydraulic Presses and Hydraulic Test Benches. Huade manufacture to world standards, including ISO-9001, and have obtained an environmental system certification ISO-14001. What’s more, they have accreditations such as GB/T28000, CE Certification issued by TUV Rheinland Group. If we don’t have it in stock, delivery time is 4 weeks! As well as completing the design of the power pack with electrical and electronic requirements, we offer a turnkey project to include the installation. Get a quote from Fluid Power today for your Huade Products!